There is no question that a nuclear North Korea armed with long-range missiles is a deeply undesirable outcome, and one that poses significant dangers to the United States, American allies, and regional stability in Asia more broadly. Framed in nonproliferation terms, the fact that North Korea has conducted six nuclear tests since 2006 alongside a successful missile program speaks to a catastrophic failure. Reconsidered in deterrence terms, however, North Korea is a precarious but tractable problem. Why have foreign policy elites been so reluctant to reconceptualize the North Korea crisis accordingly? The answer lies with the legacy of the First Gulf War. Coming at the dawn of the post-Cold War Era, the conduct and after-action analysis of Operation Desert Storm shaped Washington’s threat assessments in enduring ways. The war highlighted the danger posed by regional powers’ nuclear proliferation, and America’s insufficient tools to counter the spread of the world’s deadliest weapons. As such, it inaugurated the post-Cold War preoccupation with nuclear proliferation as the primary threat to the United States in the unipolar era — a preoccupation that only compounded over time, as Washington grew increasingly accustomed to unfettered military dominance. Nuclear nonproliferation is by no means a uniquely post-Cold War concern. The United States has had a longstanding interest in stemming the spread of the world’s deadliest weapons — first to prolong its nuclear monopoly, then later as a means to constrain allies and keep nuclear weapons out of the hands of adversaries like China, the “rogue state” of its day. Yet nonproliferation was by no means viewed as an absolute end in itself, and was readily subordinated to broader geopolitical concerns. 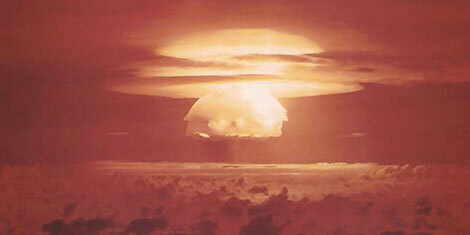 When India conducted its first nuclear test in 1974, for example, the Nixon administration responded with equanimity. The Iraqi nuclear program was massive, for most practical purposes fiscally unconstrained, closer to fielding a nuclear weapon, and less vulnerable to destruction by precision bombing than Coalition air commanders and planners or U.S. intelligence specialists realized before Desert Storm. Following the war, U.N. inspectors uncovered more than 20 Iraqi nuclear sites, including 16 “main facilities,” most of which were previously unknown. The fact that Iraq had been using electromagnetic isotope separation to enrich uranium only made matters worse, as U.S. intelligence should have detected such an energy-intensive mode of fissile material production. Moreover, despite the U.S. military’s phenomenal battlefield performance and deployment of a new generation of high-tech precision-guided systems, the air campaign against Iraq failed to substantially degrade Iraqi nuclear facilities: The United Nations contended that American air power had no more than “inconvenienced” Saddam Hussein’s nuclear program. Twenty-seven years after Iraq’s invasion of Kuwait, there is now ample evidence with which to evaluate this lesson of the First Gulf War. Overall, the intense foreign policy focus on countering the spread of nuclear weapons has been remarkably successful — particularly compared with the most alarmist predictions of the early 1990s. The past two and a half decades have yielded significant diplomatic achievements: Ukraine, Belarus, and Kazakhstan gave up their Soviet-era nuclear weapons caches; Libya agreed to dismantle its nuclear program; and South Africa voluntarily relinquished its nuclear weapons and joined the Nonproliferation Treaty. The nonproliferation regime has strengthened significantly, particularly with the introduction of the Additional Protocol, the indefinite extension of the Nonproliferation Treaty, the passage of U.N. Security Council Resolution 1540, the advent of capacity-building efforts like the Proliferation Security Initiative, and the 2015 nuclear agreement with Iran. Yet the proliferation alarmism born of the First Gulf War also led to a major blunder. In contemplating the 2003 invasion, the policymakers of the George W. Bush administration — many of whom had also served during the First Gulf War — extrapolated from previous experience and presumed the Iraqi nuclear program was farther along than intelligence indicated. The result, of course, was a long and costly war initiated on false premises. Meanwhile, the advancement of North Korea’s nuclear program represents the greatest failure of Washington’s post-Cold War nonproliferation policy. Despite more than two decades of effort, American policymakers have been unable to identify a combination of carrots and sticks sufficient to persuade the North Koreans to abandon their nuclear program. The hyper-authoritarian and well-armed North Korean regime, supported by Chinese patronage, has proven remarkably resistant to normative and economic pressures. It would be overly fatalistic to assume, however, that North Korea was destined to acquire nuclear weapons and increasingly sophisticated delivery systems. Rather, Pyongyang benefited from Washington’s intense focus on the Middle East. In the wake of the First Gulf War, American policymakers were highly attuned to the danger of proliferation in Iraq, and went to war over an exaggerated Iraqi threat while taking too long to appreciate the far greater risk of North Korean nuclear acquisition. America’s distraction in the Middle East was not lost on the North Koreans, who conducted their first nuclear test in October 2006, at the height of America’s Iraq entanglement. In an essay published shortly after the Gulf War, Joe Nye wrote: “Nonproliferation is only one of the objectives of American foreign policy and must always be weighed against other objectives, such as regional security or human rights.” Today, such a statement seems radical. With the absence of a great power competitor over the past two and a half decades, nuclear proliferation emerged as the greatest national security threat to the United States. From the 2003 Iraq debacle to former Secretaries of Defense Ash Carter and Bill Perry’s 2006 advocacy of a preventive strike on North Korea, national security elites from both parties have calculated that the use of force is warranted to prevent nuclear proliferation. Given this deeply entrenched preoccupation, admitting defeat when it comes to North Korea’s nuclear program is particularly painful. Yet insisting North Korea remains a nonproliferation issue — that is, holding out hope for near-term denuclearization — rather than focusing on deterrence obscures the right path forward. Leaders in Washington should start by deescalating the current war of words between Trump and Kim, which serves only to heighten the risk of war due to miscalculation. Instead, the Trump administration would do well to emulate the rhetoric and temperament of Secretary of Defense Jim Mattis, who seems to understand that overwhelming U.S. nuclear and conventional military superiority obviates the need for bombast and accentuates the value of clear red lines. Meanwhile, the prospects for diplomatic success will be greater if the United States does not demand denuclearization as a precondition for negotiations — and if the president does not directly undermine his chief diplomat’s efforts to open a line of communication to Pyongyang. Yet learning to live with a nuclear North Korea is not tantamount to the abandonment of nonproliferation as a central goal of U.S. foreign policy. Washington’s general record of success remains to be defended and extended. Trump’s upcoming decision on certification of the Iran deal presents an important opportunity for the administration to signal America’s continued commitment to the nonproliferation regime. It can do so by abiding by the terms of the deal while pursuing vigorous and honest enforcement. Indeed, upholding the deal is America’s best hope to ensure the prospect of Iranian nuclear weapons remains a nonproliferation issue — rather than the next nuclear deterrence challenge. Rebecca Friedman Lissner is a Research Fellow at the University of Pennsylvania’s Perry World House.